I have seen candidates wait out an impending lay-off just to keep some glimmer of hope that it may not come. If you work hard enough and become very good at what you do, you should feel comfortable moving to another company. It’s worth the risk, if you make an educated, carefully considered decision. There are certain facets of business that some people are not effective at doing for the sole reason that they don’t like doing those things. For me, it’s numbers. Even though I had a minor in accounting, I can’t stand looking at them nor do I waste my time with them. Good managers take their team and divide tasks according to each person’s strengths. This is all well and good, but the problem is that there are not many good managers. If your boss is not implementing this sort of strategy and you find yourself waking up in the morning in agony, then it’s time to leave. Personally, I don’t like working with large companies nor did I enjoy my short stint in the corporate world before I started my business. The minute a company goes public, they have little loyalty for their employees. They have to increase numbers from the last quarter and many of the executives are too busy being stressed by this. The outcome is that they don’t care to spend 10 minutes with you. Corporations are not in the business of making you rich. If you have this feeling and don’t see much of a future within the firm, leave. 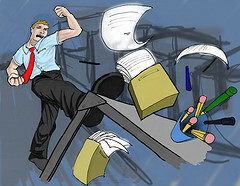 My applicants who come from the financial sector have miserable stories about their co-workers. I’ve been told by a plethora of people that there are drugs being used, and the worse part about is that this is the norm; the financial-related applicants tend to describe such illegal and dangerous situations with a blasé attitude. The people around you can have a tremendous impact on how you behave at work and how complacent you may get, sensational stories about office drug use aside. If the attitude is one that gives the message of, “I don’t feel like doing it,” take the risk, leave the firm and find a company that has ambitious people within. The moment the phones die, your career begins to deteriorate. Cold-call all you want, but it’s still not going to do any good. The determination as to whether to stay at your company comes down to incoming business. If the phones go silent, don’t think that you have this undying loyalty to the business owner. It’s business. Leave and get a new job at a better company. Ken Sundheim was the founder is the acting President of KAS Placement. KAS KAS Placement Recruitersdoes executive search for companies ranging from BNY Mellon to smaller, start-up organizations. The agencyRecruiters New York City was founded by Ken from a studio apartment on the Upper West Side of Manhattan. KAS Recruiters Washington DC KAS Placement also has 2 new businesses ready to launch this year. Ken and his wife, Alison, live on the Upper East Side of Manhattan. Ask Brian: Maternity Leave: What to do about nursing mothers – returning to work? Your an idiot! If you have a family, you deal with it and continue to look for another job. You don’t just quit! I’m in the process of finding another job. I can’t just leave like Christo, but I finally got the wife to let me leave my current “stable” job for something closer to home and less stressful. 1. While my job didn’t focus on my weaknesses, it didn’t play to my greatest strength, creativity. 2. While I had just had a promotion, I felt insecure with the owner’s children appearing to be destined to be my boss one day. I wanted to escape nepotism. What’s funny is that in my next job, nepotism in the form of the owner’s nephew created major headaches. I learned that you can’t escape human nature: there will always be people who are jealous of talent who need to be won over through kindness and self-sacrifice. And the opportunity for creative expression never materialized until I started my own company and began to be rewarded by clients who were willing to pay for it. But then, I learned that when given full expression of our own ideas, we still need counter-balancing forces and conflict in order to bring those strengths into full actualization through the mitigation of our weaknesses. So are we going to experience conflict with a Controller or a wife/bookkeeper? an IT department or a computer that doesn’t understand English? Be sure to tell your readers that there is a yin and yang in every situation of life… and we need to hold our own feet to the flame in order to learn the most from it. My main issues are #1 and 3. My coworkers are, well, varying. Some do a good job, others couldn’t care less about their work, many are more interested in climbing the social ladder than anything else. To top things off, the head supervisor is one of those people who love kiss-ups. I try to do my job and stay out of the drama, but it’s just too difficult. I wish people would work as hard at their jobs as they do whining about everyone else. As for #1, I recently took on an added duty (sort of like a part-time job) in addition to my other duties. The problem is, the added responsibilities are really not suited for me. It’s more like marketing/pr/fund-raising and I just am not good at that type of stuff. And the worst part is the guy who used to have that position (he is still working within our organization but in a different dept) – he’s still somewhat (unofficially?) involved over in our area. Now, I get it – he’s great at what he does, the bosses love him and wisely welcome his assistance. But I just feel like I’m being placed in an unwinnable situation – I’m never going to be better at my new tasks if I don’t have the chance to improve them, and people will continually look towards him as being the star worker (and my weaknesses will be glaringly obvious). I think it’s time I start looking for something else. I have to agree, at my current job the supervisor is always lying to our team while saying he is being honest. He is making a lot of mistakes lately, even after we’ve warned him about them. Also I have a coworker whom should have been promoted long ago, yet he is always fed some BS. about the promotion. This makes me feel that there is no chance for growth for me here. I am also startIng to believe that my application for a job in another dept. Was blocked since I didn’t receive an interview, nor a phone call or letter to let me know I didn’t get it lust as even outside prospects get. However I am getting my bachelors degree and tuition reimbursement is a benefit I just can’t part with right now among other things. Also I love the team I work with as we are always helping each other out. I find this concept unoriginal…common sense in a perfect world. It’s the reality of extenuating circumstances and limitations that bar us from picking and choosing our dream job. I’m pretty sure all of us have some concept of satisfaction and dissatisfaction in the work place….and on one level or two we all know that we are not happy with our current position or company in one way or another. The fact of the matter is, sometimes the risk of fleeing one job knowing the next could be just as grueling is not worth the sacrifice of certainty with regard to your income.